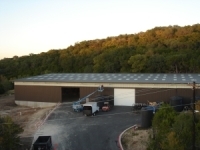 The Green Guys Environmental designed this commercial installation for AG&M Granite in Austin, Texas. Average annual rainfall for this area is 32". 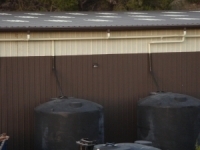 The Lower Colorado River Authority required rainwater collection from AG&M's 30,000 sq. ft. warehouse in order to reduce the size of their retention pond. 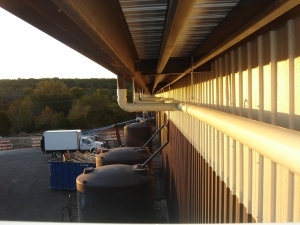 4" PVC pipe was run in the air to direct the water to three separate 9,000 gallon tanks. 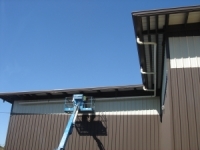 The PVC pipe was painted to maintain the aesthetic quality of the building and to protect the pipe from UV rays. A 30,000 sq. ft. irrigation field with native landscaping will be the discharge zone for the collected water. 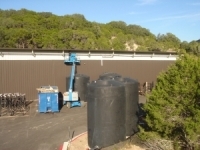 There are also two 6,000 gallon tanks for fire department use. For more information, contact The Green Guys.